YouTube clip showing the fateful moment of impact on Blue Monday. In case you’re wondering, I’m the one on the right! I liked the Astros. 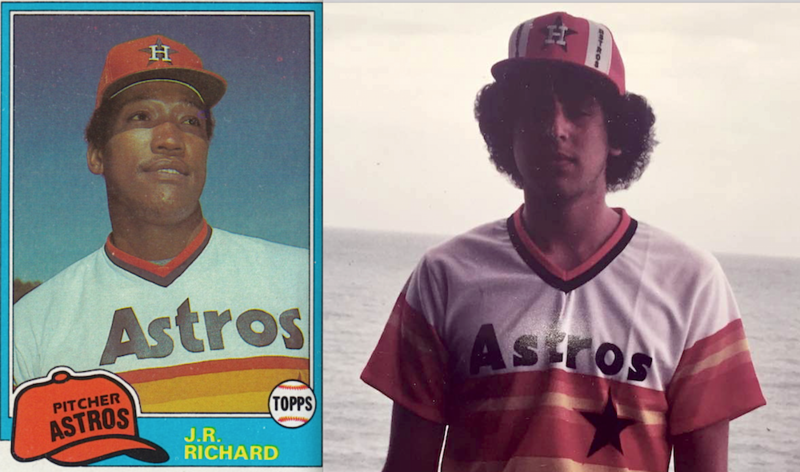 Yes, the garish, colourful uniforms were part of it, but I liked J.R. Richard. 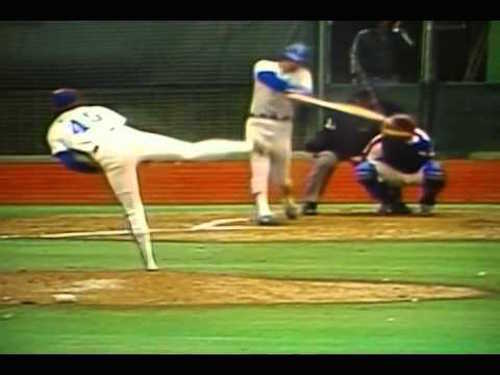 He was 6’8”, threw 100 mile per hour, and he struck out 303 batters in 1978 and 313 in 1979. The funny thing is, I don’t remember a single game I ever saw him pitch! I never saw the Astros live, and there was only one Game of the Week on television, and Houston didn’t get many of those. 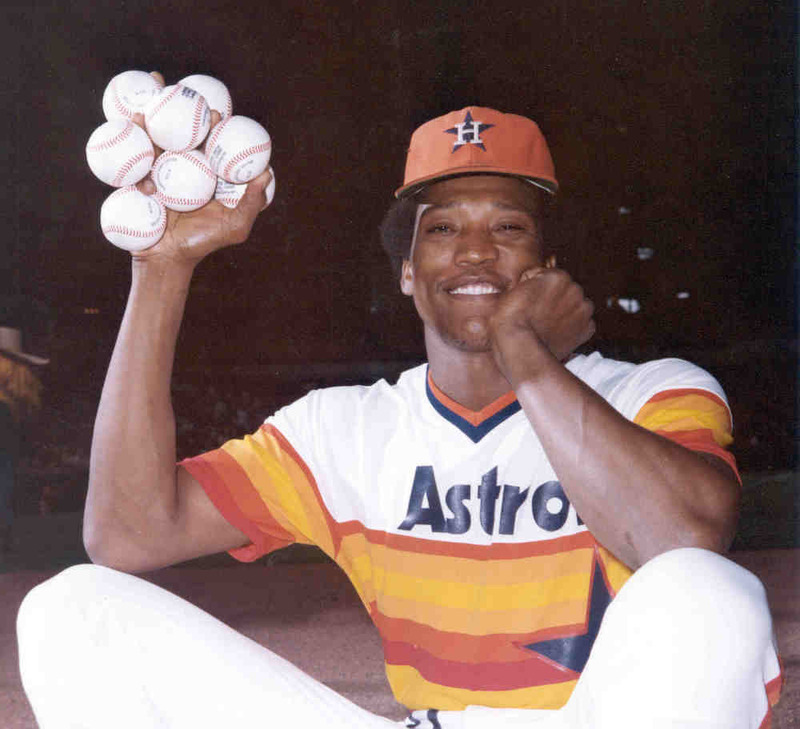 I must have seen him on This Week in Baseball, and I clearly remember the photograph of him holding eight baseballs in one hand. By 1981, we’re all huge baseball fans, and all of us – except Pirates fan David – also like the Expos. And, of course, Montreal is a lot closer to Toronto than Houston, San Francisco, or Los Angeles. I don’t remember which of us decided we should go, but Rob’s family had connections in Montreal and he could get us tickets for Saturday and Sunday. So off we went. We were all in Grade 13 (a foreign concept, I know, to any Americans reading this, and even to any younger Canadians) but we skipped the day of school on Friday and piled into Steve’s car. I don’t remember much about the drive, except that as we got to the end, the fact that Pie IX is pronounced like “Pee-Neuve” led to some problems getting to Olympic Stadium. But we did get there and we picked up our tickets. I don’t think any of us ever considered getting a hotel room. Rob’s family had friends that he and Jody stayed with, and I asked a cousin-in-law of mine if Steve and I could stay with relatives she still had in Montreal. No problems for Rob and Jody, but when Steve and I showed up, it was clear this family we were staying with had only been expecting me … and they certainly weren’t prepared to feed dinner to the two of us! Steve and I found somewhere cheap nearby, then met up with Rob and Jody so – even though only Steve and Jody were actually of legal drinking age – we could go downtown and watch the Friday game in a bar. The Dodgers and Expos had split the first two games of the series in Los Angeles. The Expos won game three in Montreal that night 4-1 on the strength of a complete game pitching performance from Steve Rogers and a three-run homer in the bottom of the sixth by light-hitting Jerry White. I do remember the excitement in the bar … but what I remember even more was our waitress throwing back the change we had left her as a tip on our first round of drinks! Game 4 was on Saturday afternoon. It was close, and tense … until the Dodgers blew it open with two runs in the eighth and four in the ninth for a 7-1 victory. It was cold and dank, but for me (and I’ve been to at least one postseason game every time the Blue Jays have made the playoffs) this was still the single best fan experience I’ve ever had at a game! The joint was jumpin’, and singing along to The Happy Wanderer (“Valder-ee, Valder-ah, Valder-EEEE, Valder-ah-ah-ah-ah-ah-ah”) was a blast! Even the loss wasn’t so bad, because now we could be at the fifth and final game on Sunday. Only it rained on Sunday, and the game was cancelled. We’d already skipped school on Friday, so Jody, Rob and Steve decided we should go home. I was beyond angry. I don’t think I spoke a word to any of them for the first few hours on the drive back to Toronto. So, we weren’t there for Blue Monday when Rick Monday took Steve Rogers deep in the top of the ninth to give the Dodgers a 2-1 series-winning victory. Of course I watched it all on television … but when all is said and done, I think I’m glad I wasn’t there. A memorable adventure, no matter the loss. As for the Pie IX, I had a similar experience way back when, trying to find a gallery. It wasn’t French though, the gallery was the Bau XI. Only it wasn’t Bow Eleven, as I thought, it was Bau Zee. Silly me. I’d been to Olympic Stadium before … and I told the guys we had to turn on “Pee Neuve” … but none of them recognized the road sign saying Pie IX as that! A good team-the Expos really battled the Phillies in 1980. It’s a shame they never won the big one. 1994 could have been if not for the strike. 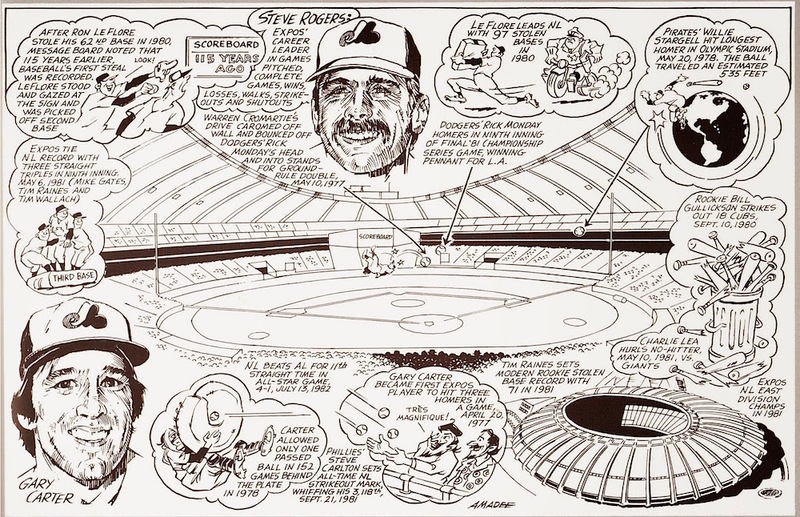 My friend Steve and I were thinking about going to Montreal for the final weekend against the Phillies in 1980. Can’t remember why we didn’t … but about a week later I got sick with pneumonia. I remember thinking that if I’d sat through that horrible, cold, wet weather for those crushing loses that weekend, I might actually have died! As you’ll recall from my comments on a previous article I DID cry-into-my-beer in my seat at ‘The Big-O’ on ‘Blue Monday’. Cashing in my set of four, 1st-base, 1st row of ‘The Ring’, World Series Tickets was the hardest thing I ever had to do. However, I was born in Montreal (Westmount) and raised in Pointe Claire on The West Island but even I had it all wrong. I had heard ‘Pee-Neuff’ mentioned on the radio since a child and heard it referred to in many contexts over the years of my life at the time but it was over on the other side of the city. It might as well have been the other side of the world. It wasn’t until I was 20, in the summer of ’67 when, with my three buds, driving to the World’s Fair, ‘Expo-67’ for the first time that we ALL got jolted into reality. We drove all around (NO ‘googlemaps’ back then) the area we had been directed to looking for the on-ramp to the bridge to Expo. ‘PEE-NEUFF’…where the heck was it. We kept coming upon this signed street “pie-eye-ex” (‘Pie IX’)…”What is this damn ‘pie-eye-ex’?” we kept saying to each other…how come none of us has ever heard of it? Finally we literally stopped, on ‘Pie IX’ and asked a pedestrian if they knew where the street ‘PEE-NEUFF’ was. He looked at us as if we were crazy and said; “C’est ca!”. We were STILL in a fog. “Quoi?” (What? ), we said…looking dumber by the minute. He grinned and laughed, GETTING our ignorance before we did. It hit us ALL at once!